I’m not going to lie, this last few weeks have been a total struggle for me as far as meal planning is concerned and that’s not good at all because when I don’t have a meal plan or when I don’t stick to a meal plan that I’ve written, I go WAY over budget usually. I’ve been really good at sitting down and doing my meal plans but the struggle comes during the week when I’m getting in from work later than usual and don’t have the energy to actually prepare what I had planned. I do feel like I’m starting to get into a bit of a rhythm this last week though and I think that I should be OK with things again going forward. I’ve been a bit cleverer with this week’s plan and actually have three meals that I’m not going to be cooking, one from the freezer and one slow cooker meal which should make things easier. Monday is Hunters chicken which I know my husband can prepare as he’s on an early finish so will be in before me – he’s . not a great cook though and definitely isn’t comfortable in the kitchen but I think he should be able to manage this. 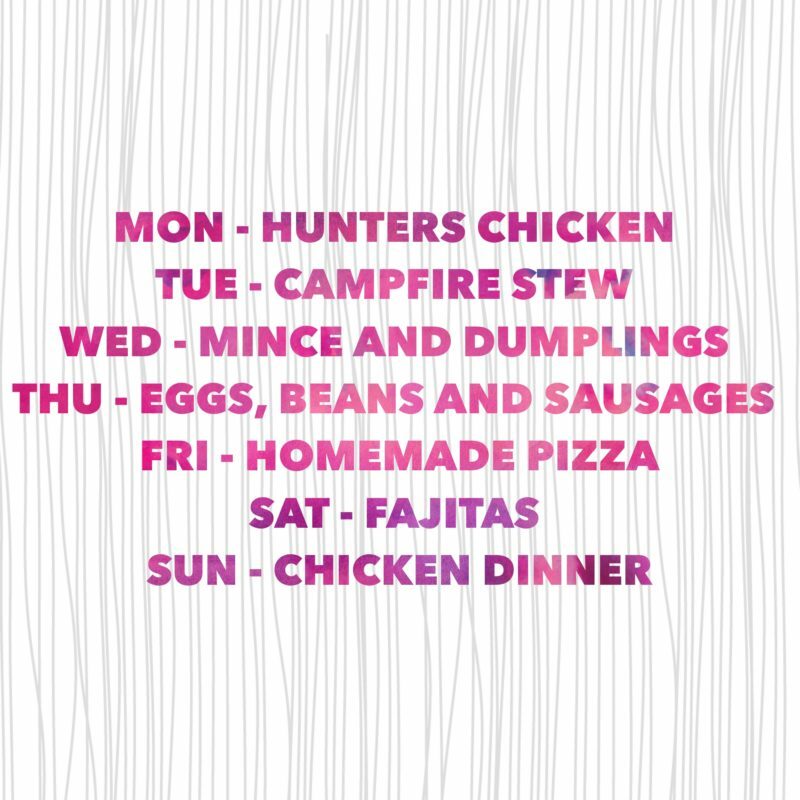 Tuesday’s campfire stew is a Slimming World special that I can pop in the slow cooker before I go to work and it should be good to go when I get home to just serve up. Wednesday is mince and dumplings from the freezer which will be super easy as long as I remember to get it out of the freezer on Tuesday night. Thursday is the meal I’m most looking forward to as everyone loves eggs, beans and sausages. I’m going to get my 13-year-old to make the pizza dough ready for when I get in on Friday and then we can all make our own pizzas with whatever toppings I have in. I can adapt this to my diet by making my own version of a Slimming World Syn Free Pizza which tastes amazing and means that I won’t feel left out. It’s my 16-year-old’s turn to make tea on Saturday so she’s in charge of the fajitas we’ll be having for tea on Saturday night as she’s a fajita making expert. And by Sunday, I’ll be ready to take my turn again by making Sunday dinner. Hopefully, by being a bit cleverer with my planning I should find it easier to stick to. Also, if you’re interested, I’ve just shared my ultimate guide to meal planning over on The Diary of a Frugal Family if you want to pop over and have a look at how I meal plan for my family. #WhatsForTeaTonight – Dippy egg and soldiers….